Finally, an affordable Phase Locked Loop PLL LNBF with 300KHz or better stability! A technological breakthrough! 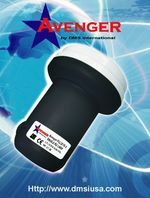 The Avenger PLL321 S-2 LNBF is about the same price as the common LNBFs available today but with reduced frequency drift which was traditionally only found in more expensive commercial level LNB's. stability of PLL at a very affordable price. These LNBFs are at least 5 times more stable than non-PLL LNBFs on the market today!! !